for having- Diamond with her than if she had been wandering about alone. She did not seem so tired as he was.
" Do let us rest a bit," said Diamond. Perhaps there's an open arch." "Hillo! here we are!" said the girl. " 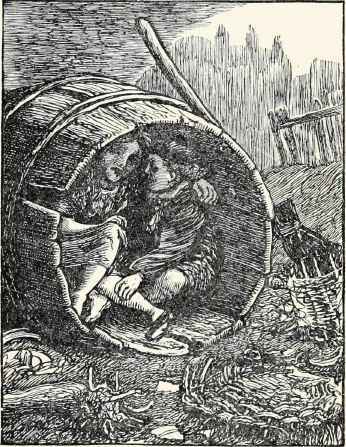 A barrel's the jolliest bed going — on the tramp, I mean. We'll have forty winks, and then go on again." She crept in, and Diamond crept in beside her. They put their arms round each other, and when he began to grow warm, Diamond's courage began to come. "This is jolly!" he said. "I'm so glad!" "I don't think so much of it," said the girl. "I'm used to it, I suppose. But I can't think how a kid like you comes to be out all alone this time o' the night."